Apple today shared its latest report on diversity and inclusion, detailing its hiring practices over the course of the last year. According to Apple, from July 2016 to July 2017, half of all new hires were from "historically underrepresented groups in tech," including women, black, Hispanic, Native American, Native Hawaiian, and Other Pacific Islander. 25% of new hires in 2016/2017 were Asian, 11% Black, 15% Hispanic, 4% multiracial, and 43% White. As of 2017, Apple employees, including retail and tech, are 68 percent male and 32 percent female. 21% are Asian, 9% are black, 12% are Hispanic, 3% are multiracial, and 54% are white. 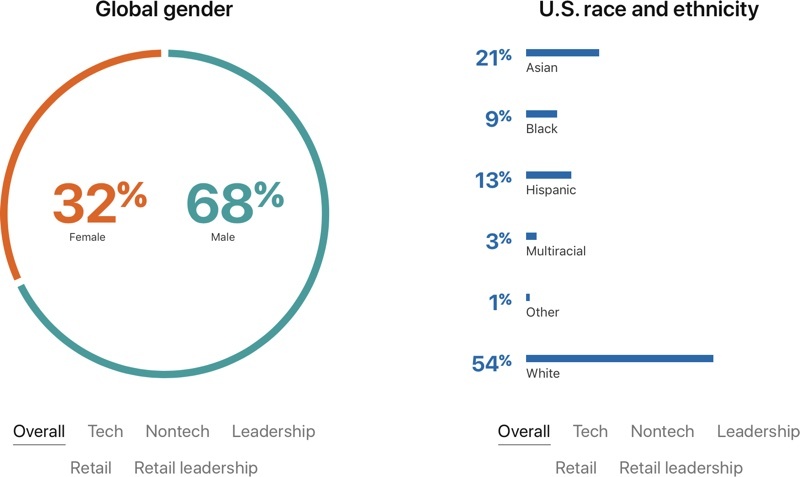 Apple's tech only and leadership only breakdowns continue to skew more heavily towards white and male, however. Female representation is "steadily increasing" and is up 5 percent since 2014. 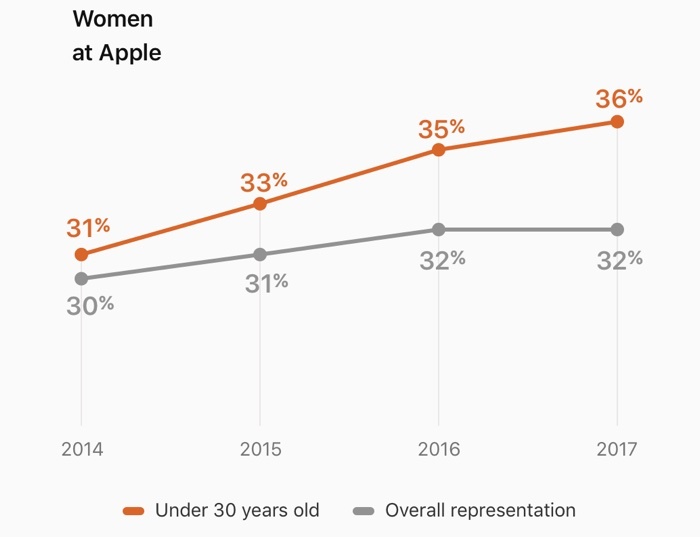 36 percent of Apple employees under 30 are women, and 32 percent overall are women. Apple says that 29 percent of "leaders" at Apple are women, a one percent increase since July of 2016. Apple says that "meaningful change takes time," but with 130,000 employees, even "small percentage point changes" have the potential to affect thousands of people. A two percent increase in female representation since 2014 equates to 37,000 female hires across the globe. Further breakdowns of the diversity at Apple are available through Apple's updated Inclusion and Diversity website. Other topics on the site include education, programs for veterans, pay equity, accessibility, LGBTQ advocacy, and supplier programs. Apple says it's proud of its current accomplishments, but there's "much more work to do." "As we strive to do better, Apple will remain open. As it always has been. And always will be," reads the diversity site. I think it's disgusting to even consider anything other than a candidates merit, when deciding on who to hire. If you get tens or even hundreds of applicants for the same position with roughly identical credentials, as is often the case in many STEM fields, then whom do you hire? If there are really that many that are really that identical in terms of stats that matter, then pick one at random. I can tell you what you DON'T do: you DON'T say "well we need a few more brown (or white, or any other shade) ones." Which is exactly what's happening. Why are americans so obsessed with those statistics. I dont think i ever ran across a paper asking me „what i am“ here. Meanwhile first paper i had to sign in the US had a ethnicity question in it. Oh let’s make a graph showing how we separate people and hire people based on their thing that makes them different. More liberal nonsense. "Oh, look at how inclusive we are." At the same time you're promoting Islam, in general the most oppressive and intolerant religion in the world, by pushing jihab-wearing woman as the new normal. Of course #notallmuslims, but in general the Muslim Arab world lacks tolerance of anyone but themselves (if that), and when you get a critical mass in a given area from mass immigration and high birth rates - enter sharia, FGM, widespread anti-semittism, attacks on freedom of speech, and all kinds of backwardness. I'm amazed that people can become so naive, that they actually buy into this stuff - as well as cultural appropriation, intersectionality etc. This is Cultural Marxism - look it up. Isn't this the very definition of "racism"? Did you know that Afro-Americans can get into Harvard University with a 450 points lower SAT score than an Asian-American, and about 370 points lower than a White person. American Universities and corporations are actually discriminating against the most talented people and ethnic groups in the name of political correctness. The biggest looser is the ethnic group North-East Asians, which on average has a higher IQ than white people. I'm so friggin' tired of this "liberal" nonsense. This is why Donald Trump won, and probably will win again in 2020. People who think this is bad fail to realize what is "normal" today. This obviously sounds weird, as if they're hiring people based on race or sexuality; but it only seems weird if you don't see the bigger picture. It's NOT a coincidence that men, often white, are CEO's and top executives. There is institutionalized racism, and that's a fact. It stems from western culture and how it was built up. So, although it seems contradictory to consider race or sexuality when hiring people as the argument is "equality", you have to realize we're currently not on a level plane field, so it's necessary to have a conscious effort to add diversity in the way Apple's doing it. Whoa, stop right there. Institutional racism contends that it exists without showing any rational examples. Show me specific cases where its spread nationwide. Women in tech is a discrepancy that primarily has to do with interest in that field is not that prevalent. Shown by courses that are not enrolled by women indicative to STEM subjects. Women tend to place life satisfaction over job satisfaction, which is a choice rather than discrimination. Why don't we ever ask why we don't have more men in Human resources, teachers, nursing, social worker or physiologists? Along with other jobs dominated by women?!? Why isn't there a bigger push in getting men in to these fields? I can tell you what you DON'T do: you DON'T say "well we need a few more brown (or white, or any other shade) ones." Which is exactly what's happening. Actually, that's what you do say. If you have 130,000 employees and they're overwhelmingly white then you're doing something wrong. Period. You don't have to hire a black person for every white person you hire, but you need to ensure that you're hiring fairly. So if 10% of the qualified marketplace is Asian and your workforce is only at 2% (making numbers up here) then you need to ask yourself why there's a disparity. Hiring on merit seems to be exactly what the data shows. It's more a case of being open and proving there's no nepotism or cronyism going on, I'm sure there are many companies still hiring based on who you know rather than what you know. Also by publishing the data it must benefit Apple in that talented people from all walks of life are more likely to apply to work there, rather than dismissing them as a company filled with middle-aged white men.